CBDepot’s work has been constantly driven by innovations. We have been bringing new isolated cannabinoids and new preparations for food and food supplement sectors which takle the Novel Food regulation on hemp derivatives in the EU. CBDepot already introduced the world’s first pharmaceutical GMP natural CBD isolate to the API segment during the world’s biggest pharmaceutical event, the CPhI in Frankfurt, in October 2017, through its contract manufacturing partner Vakos XT. 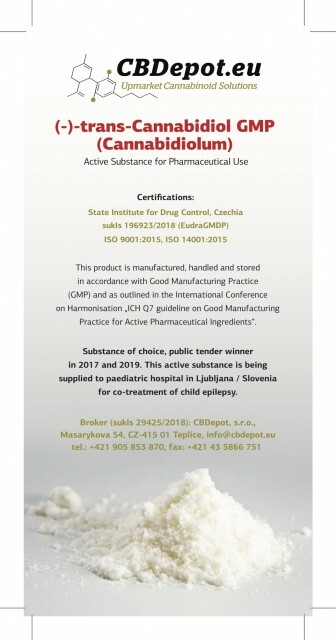 The very next month, in November 2017, CBDepot in cooperation with its distribution partner Farmakem won a tender for deliveries of GMP CBD to a public paediatric hospital in Ljubljana, Slovenia, for co-treatment of child epilepsy. Farmakem played a vital role by regulatory development of the product and in the process of public tender. This is a major breakthrough in cannabinoid-based therapies in the EU and could not happen without the dedication of Farmakem and Prof. Dr. Neubauer. Prof. Dr. Neubauer has a long record of clinical experience in treating his paediatric patients with CBD and reports the best outcomes when CBD of natural origin is being administered to his patients. In 2019, again through Farmakem, this active substance has been confirmed as the substance of choice at the paediatric hospital in Ljubljana and additionally also in the tender at the Institute of Oncology in Ljubljana.